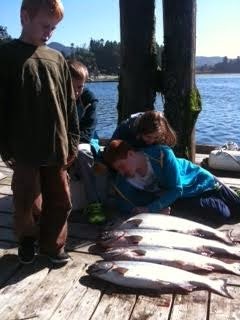 The salmon fishing in Sooke has really heated up lately. Luke from VIP Fishing reported a fun day this week: " Fishing with Catherina and her 4 kids we caught 4 big chinook in just 2 hours. Fishing was on fire! The kids were so happy and exited. We caught a 28,25,22,15 lbs. ... wow what a day!"